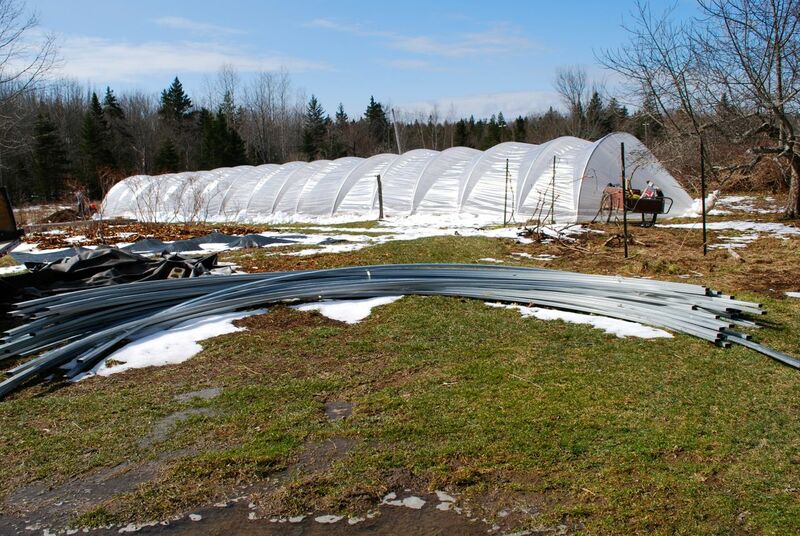 Fifteen people showed up for the hoop house workshop on April 7 despite dire weather warnings. We put up the 96 foot house in an hour and a half, taking extra time to wrestle with the wind and talk about what we were doing. The galvanized metal hoops from Norm of Multi-Shelter Solutions slipped easily on to the rebar anchors. We were impressed. This is a slightly more expensive hoop ($35) than our original self-bent hoops ($28) from Russel Metals, but it doesn’t rust. Norm was worried the rust would be abrasive on the plastic hoop house covering and lead to a shorter life-span. We have 3 houses with the old method and this latest one with Norm’s hoops. We’ll let you know how it compares. Last weekend the folks at Nature’s Route Farm also put up a 300 foot modified hanley hoop house. They also had a very windy day. They are ambitious! We went to see them on Wednesday and Kent said his arms were still sore from pulling the plastic. 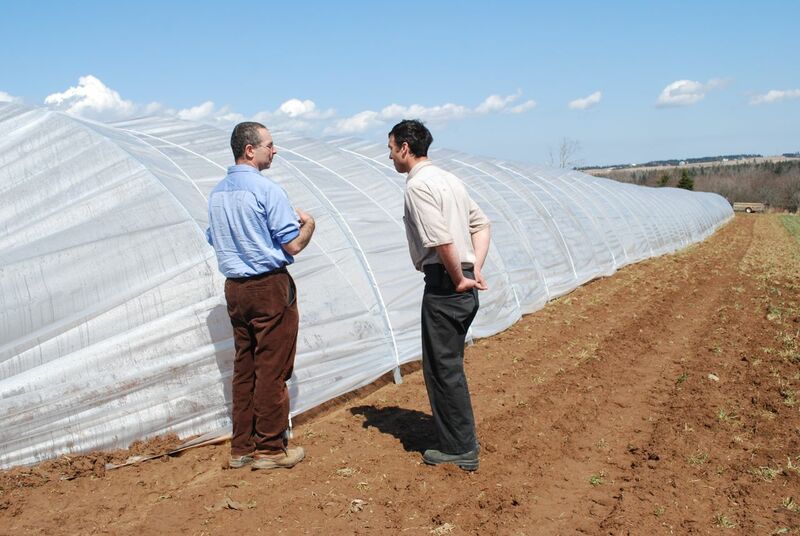 Instead of a pair of t-bars at the end of the hoop house, they used a large fence post to fasten the plastic. The t-posts would not have held the end of such a long hoop house. 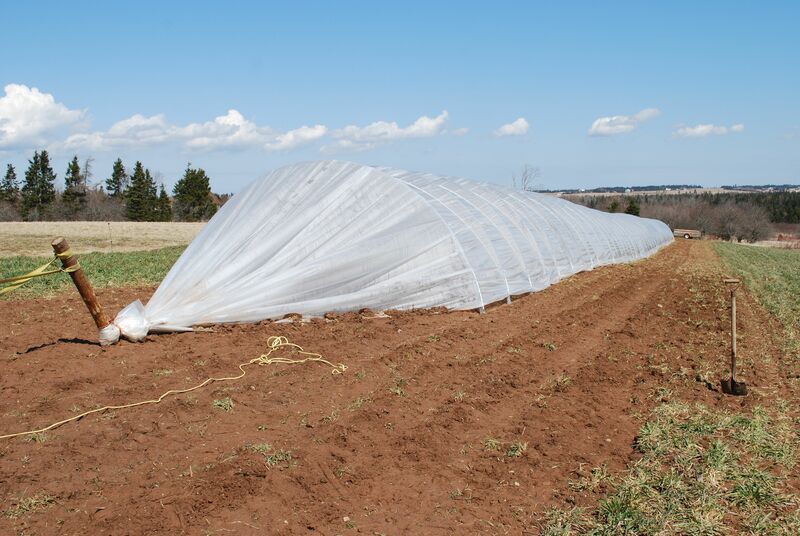 Kent and Ruth felt that the cone of plastic at the end of the hoop house was too long and were concerned that the wind would catch it, so they plan to put bags of sand along the edge of the plastic. 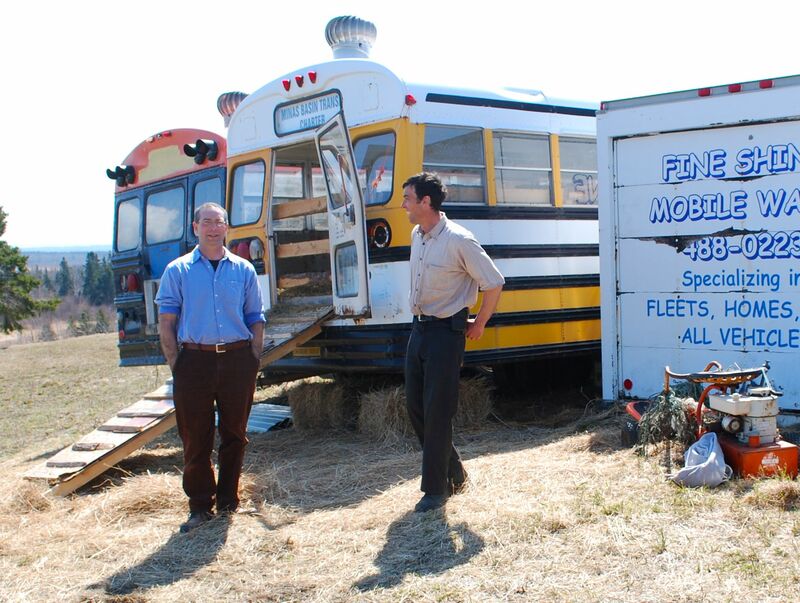 We also got to see their modified school buses used for sheep housing. Very economical! They installed vents on the top and the sheep seemed very comfortable and happy. They are working on lowering the buses to eliminate the need for access ramps. This entry was posted in efficiency, Hanley Hoop House, season extension and tagged Abundant Acres, Nature's Route Farm, season extension. Bookmark the permalink. Wish I had been able to make the workshop, next time. Was wondering what weight is the poly? And any suggestions where I can get it. I think it’s a great project and want to try one. We ended up shortening the end by about 4 ft – it looks better and seems to catch a lot less wind! We added another post on each end and tied the top of the first one to the bottom of the second – bracing it from being pulled out. looks great, so how long does that kind of plastic last in those conditions, are you replaceing every couple of years? 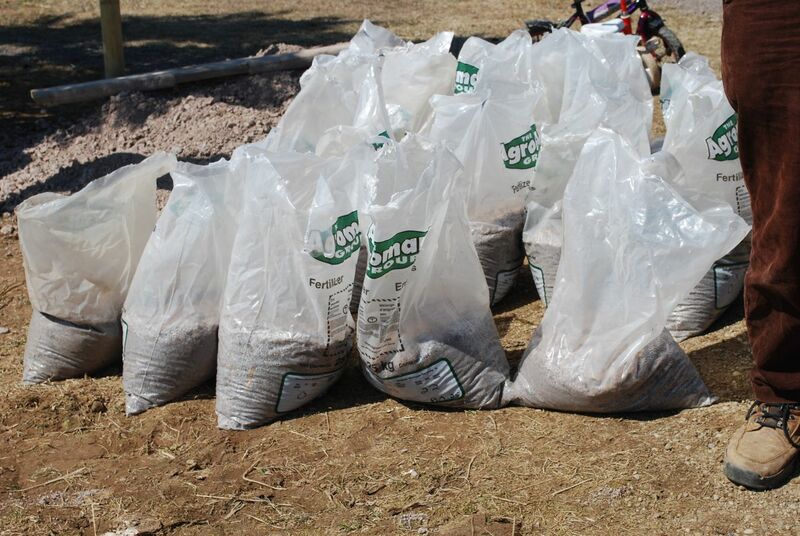 We hope the plastic lasts about 3 years. I heard that plastic should be good for 5 years. How much did you end up spending on the whole house? we have a used one up the street but I think that taking it apart will take more time than its worth. they want $2500 USD for hoops, benches, heater, exhaust fans – I think I’m better off with new…I’d love input. This greenhouse will collapse under snow load if you don’t remove the poly right ? Doesn’t look like a very strong design for winter use. The Hanley hoop house is not designed for heavy snow loads. We uncover the houses in December and put the plastic on in late February. If a really big snow is predicted, we can easily uncover the houses again. It only takes a few minutes to slide the plastic down to one side and about ten minutes to bring it back up into position after the storm. A friend mine with five of these houses left them up over the winter in snowy New Brunswick. He reported that the houses were covered completely over with snow and did not deform at all. I might try leaving one up next winter as an experiment, perhaps with the ribs at 4′ instead of 6′ apart. Do you plan on holding the workshop again in future? Sorry for the very late reply! 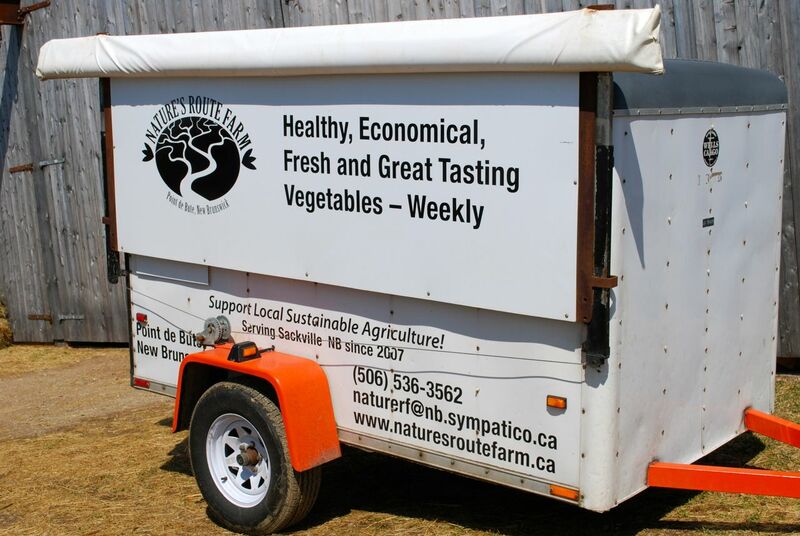 Yes, we’ll be holding several workshops at Bethany Garden in Antigonish over the 2014 growing season. 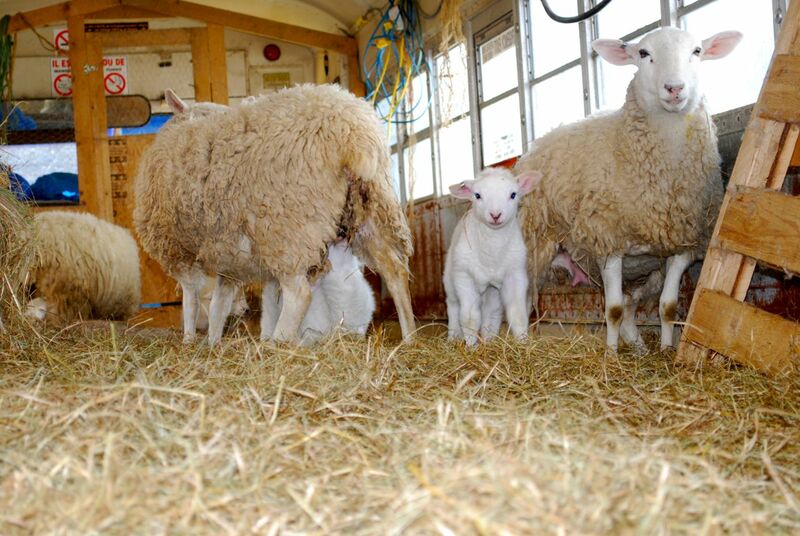 We’ll also have open farm days at our farm in Center Burlington.